Diane St. Jean is a reading teacher at Barrington Middle School. She is passionate about bringing subjects together for her students and this fuels her commitment to environmental education and using PLT. After attending a one-day workshop in 2008, Diane participated in our yearlong program called a Forest for Every Classroom (FFEC). 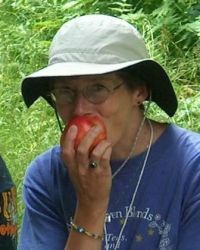 Diane developed an interdisciplinary unit called Discovering and Valuing the Forest through Story and Experience during the FFEC program. She uses this unit to introduce her students to the Haley Forest on the school property, its ecology, and its past and present uses. She includes a lesson on nonhuman threats to the forest and uses literary texts that reflect human connections to forests. This fall, Diane began the school year with her students exploring the school forest during a forest field day. All students participated and for some, it was their first time in the woods. Diane’s students will continue to study the Haley forest in different seasons over the course of the school year. At the end of the unit, students will take what they have learned and use technology to create public service announcements on forest threats, including invasive forest pests. Diane even plans to hold a “What’s Bugging the Forest?” film festival to exhibit all of the PSA’s that the students create. Virtually every student in Barrington has a forest like our school’s forest just beyond their backyard. It might be owned by their family or by a neighbor, but for the most part, it is accessible. I hope that they have been inspired to continue exploring on their own. Taking the kids into the woods and having it be an incredibly positive experience sets up the likelihood of (them) returning again and again.